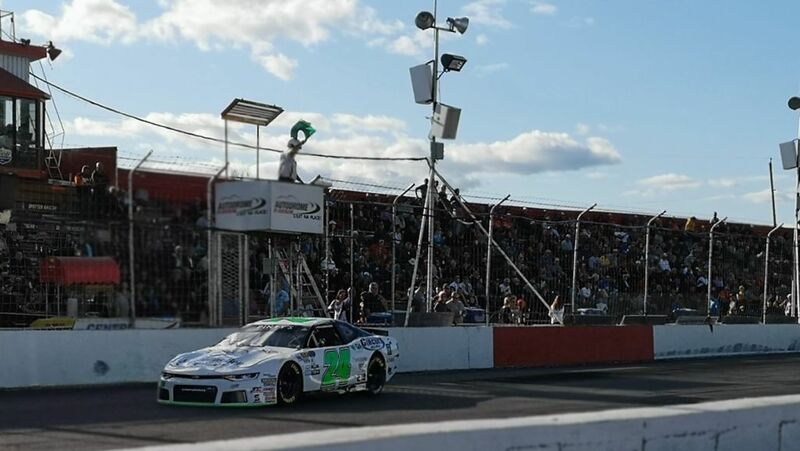 Sunday September 9, 2018, St. Eustache, QC: Race number eleven of thirteen in the NASCAR Pintys Series 2018 championship went Saturday night at Autodrome St. Eustache in Quebec. Donald Theetge driver of the #24 Mercedes-Benz St Nicolas/Circuit Acura Chevrolet Camaro ran strong all night but a late race restart cost him a podium finish. Theetge and the #24 team struggled with the car during the early practice but kept making adjustments and ended up 8th quickest. Next up would be ualifying for the Lucas Oil 250 and Theetge found some additional speed in the car and posted the 5th quickest time. “I know the car is good, so we will be fine for the 250-lap race,” said Theetge. The 250-lap main event got underway with a lot of jockeying for position. Theetge along with his teammates Camirand and Tagliani dominated the top three positions for most of the event. On the second competition caution Theetge came to pit road for tires and fuel. The car came to life again and Theetge maintained in 3rd place for several laps. Numerous caution periods would ensue, and he found himself restarting on the outside causing him to lose positions. After fighting his way back up to 2nd , a late race caution and green, white, checkered finish caused him to restart on the outside again. The result was a 5th place finish. Next up for the NASCAR Pintys Series teams is their first trip outside of Canada to New Hampshire Motor Speedway in Loudon, NH September 20th & 21st.